Our comprehensive 6 week beginners dressmaking course, suitable for anyone who can use a sewing machine to sew pretty much where they want to and has a yearning to make clothing! We’ll demystify the pattern envelope, instructions and pattern markings with you, teach you accurate sizing, measuring and cutting out, then get on and make a simple garment, including fitting a zip. If you feel you’ve not yet mastered your sewing machine, or you’d like to learn to use it we’d suggest our beginners sewing courses for starters. The course will cover both theory and practice, class sizes are small and questions are actively encouraged. 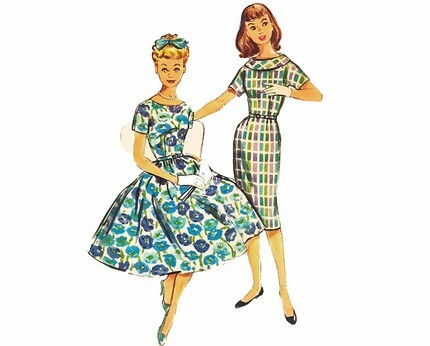 We advise you to start with a simple skirt or top, ( about 4-8 pattern pieces) and we’ll cover dressmaking techniques as needed. You’ll need a simple pattern, some fabric and Thursday evenings spare for 6 weeks. There will be some cutting out of pattern pieces and fabric at home as required, in the first fortnight so please factor in some time for this. You won’t need your fabric or even a pattern for the first session if you’d rather discuss what to buy first, although if you’ve already got something in mind just bring it along. The course runs on Thursday evenings, 6.30-8.30pm. £90 for 6 weeks. Includes refreshments and some materials. Please just pay a £30 deposit using the tickets at the bottom of the page. the number of deposit tickets left is the number of places left and pay the balance on the first session. Please ignore if there are no full price places left or listed as tickets, it’s not relevant.